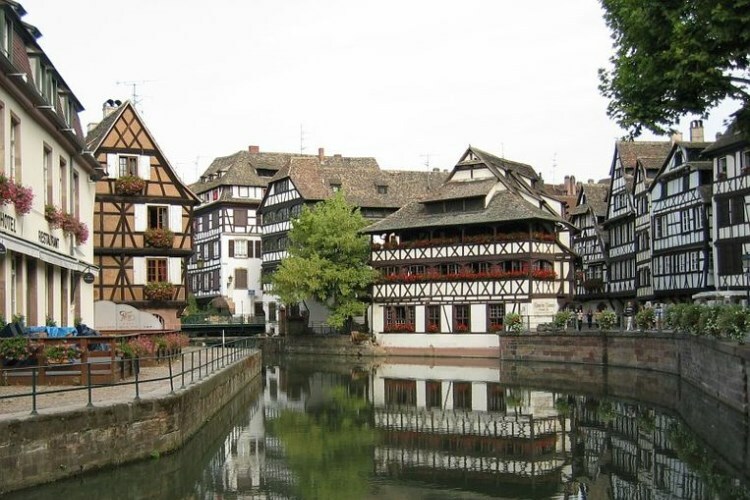 Strasbourg is a main city in Alsace; it is the seventh biggest French municipality (by virtue of its population). It is also a well of culture and history... You're intrigued by this town, aren't you? You've never been there and you want to book a hotel? You're in the right place! We have made you a list of the 10 best hotels in Strasbourg. 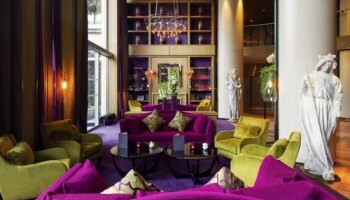 In the Petite France area, here is a hotel with much class and style! Would you like to discover the beautiful township of Strasbourg on the luxurious side? 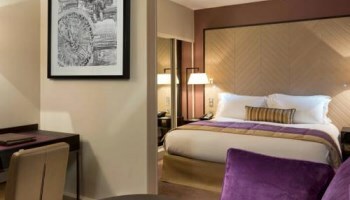 Make the most of the hotel's stars and services! Its rooms have a refined style, a sober but also modern decoration, with an alternation of cool colours (most of the time, the bedding is mauve) and warm colours (shades of beige, red and chocolate brown in the rooms, shades of pink in the common areas). All these colours mixed together will bring you a sensation of serenity and bliss, in a setting where everything was made for the customer's well-being. After a good night sleep (or a quiet day in your room), why don't you swing by GOH: the hotel's restaurant has a watchword, which is innovation. Then, you can go and sip cocktails or glasses of champagne (that's what you drink in a five-star hotel!) in the hotel's bar Le Lien. You will also have the opportunity to get better by cycling on the bikes available in the hotel. If you're more like the bookworm type, you're in the right place, there are books (no worms, of course!) in the hotel's library. What's more, you'll find the establishment's hair salon, where you will fix your face and hair, then, you'll get sweaty at the gym and choose a souvenir to bring back home at the gift shop. 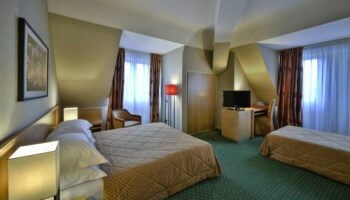 The hotel comprises 150 rooms, with a number of 28 suites. What we like: The hotel's central location, which is 8 minutes away from Notre-Dame cathedral and 5 minutes away from Temple Neuf church. What we love: Having your brunch on the terrace on a Sunday morning. This high-quality hotel will provide you with all the comfort you need to spend an extraordinary stay: it comprises a spa, where you will relax and rest, an outdoor swimming pool for the most sportive clients who want to swim some laps (or splash around in the hot tub, we won't judge you, everyone does what he/she pleases!). 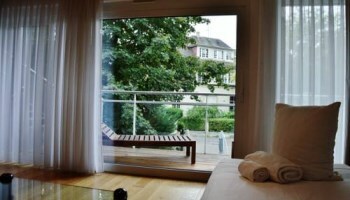 Some of the rooms also have have a balcony that looks onto the swimming pool and the hotel's peaceful garden. For those of you who don't come to Strasbourg for fun (meaning: those who are on a business trip), you might want to know that the hotel also has some rooms dedicated to business meetings and brainstorming sessions. You will also have the opportunity to savour the hotel's business breakfast, or sip the after work appetizer at the end of the day. The Hotel Novarina benefits from an impressive luminosity inside the rooms, du to the large bay windows. The furniture is modern: couches and armchairs are made of leather, the coffee table is made out of glass, etc. Thanks to the bathtubs, you'll benefit from all the comfort you need, for they are spacious, equipped with a water sprays system, and with skid proof walls. And if you're looking for even more quietude, don't hesitate and enjoy the institute's massages! What we like: The Orangerie park, a 19th century wide green space which houses Joséphine pavilion, is only 500 meters away from the hotel. It also faces the Palace of Europe. What we love: The swimming pool and its green surroundings. 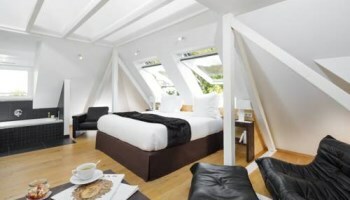 This four-star hotel is nested in a 17th century building (don't worry, it has been refurbished since). The Cour du Corbeau used to be an inn. The immaculate white sheets and walls will take you into a cotton-like and soft world. You'll sit in Louis 16th style armchairs. But you don't have to worry: the Cour du Corbeau comes with no frills. It has an unobtrusive charm, and it is full of furniture with vaporous and refined shapes. You can access the hotel from the tramway stop Porte de l'Hôpital, on line A and D. You can also get down at the bus stop Corbeau, on line 10. The cathedral Notre Dame de Strasbourg is only five minutes of walk away from the Cour du Corbeau; to reach the cathedral, you'll have to cross the Ill River through the rue du Vieux Marché aux Poissons. The renowned Place de Kléber, Strasbourg's main square, is only ten minutes away by foot. It hosts several green areas and the Christmas market. The Musée Alsacien (Alsatian museum) is less than 200 meters away. There, you will satisfy your curiosity by discovering the daily objects of 18th and 19th Strasbourg inhabitants, while going through several typical houses of the city. The hotel comprises 57 rooms; among them 19 suites. What we like: Traces of the past: many beams and woodworks on the outside, and walls made out of original stone in the inside, in the dining room. What we love: The area of La Petite France, with its churches and its half-timbered houses, is only 15 minutes away by foot. "Maison Rouge" is the French for "red house" or "red home". The choice of such a name makes sense, especially when you see the red brick walls of the building. This hotel is definitely a four-star institute worthy of its rank! First of all: it is really spacious: there are 142 rooms, along with several rooms where you will have the opportunity to organize a few seminars (if you're on a business trip in Strasbourg). 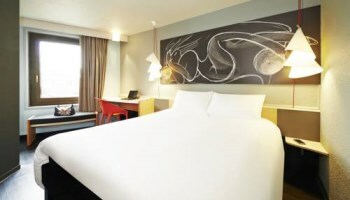 The rooms can host up to 60 customers. Furthermore, unlike most hotels (even the most expensive and most luxurious), the Maison Rouge has the characteristic of offering a baby-sitting service. Thus, you can come with your whole family, and save yourself a sweet evening as a couple or a night out in the city, without your children around! In the morning, the staff will serve you a complete buffet breakfast in the dining room, which is covered in colourful pastoral wall paintings. 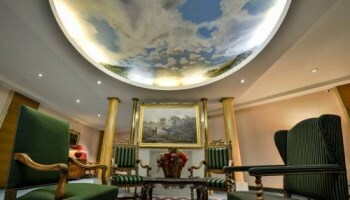 Actually, the paintings and the colours are a big part of the hotel's decoration: you will admire them in the hotel's lobby, where the shades of blue on the ceiling depict the sky. Animals and nature are also very present in the Maison Rouge: fawns, trees and foliage spring everywhere on the walls. The rooms' shades of beige, milky white and brown are in contrast with the common areas and the hall's lavish decoration: golden statuettes, trinkets and mirrors are displayed on ancient wood furniture, and surrounded by rainbow-coloured curtains and armchairs. 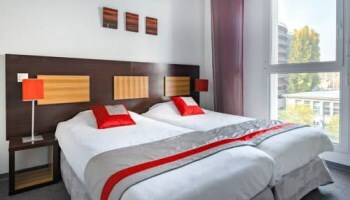 The hotel Maison Rouge is located in one of Strasbourg's central areas, only five minutes away from the renowned Notre Dame cathedral, and ten minutes away from the neighbourhood La Petite France. 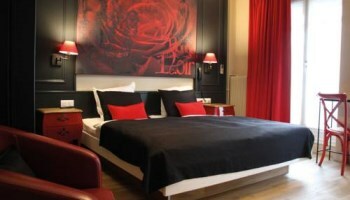 What we like: The Hotel Maison Rouge is 100 meters away from the Place Kléber. What we love: Henri Zuber's panoramic painting; Zuber is a 19th century Alsatian painter; its canvas is in the dining room. Area: Quartier de la Gare/"Railway station area"
As its names indicates, the Lagrange Apart'Hotel Strasbourg Wilson is what is known as an apart hotel. It comprises both studio apartments and apartments. There are a total of 98 in the hotel. Every studio apartment and apartment has a kitchenette with a microwave oven, baking plates and a dishwasher, so that you can make your own meal. The apartments are spacious and modern. 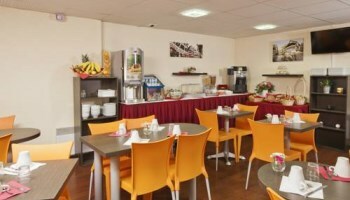 The kitchen area is also quite big, which increases the hotel's comfort even more. It should be noted that the rooms have separate shower and toilet, which will ensure you more privacy and bigger common areas. The decoration is simple, with no frills, mostly composed of shades of grey, white and red. The Lagrange Apart'Hotel will be like home to you, your home sweet home. Furthermore, you'll benefit from the exceptional services provided by any four-star hotel: a heated swimming pool, a sauna, a steam room and a fitness centre are open for the customers inside the building. Wi-Fi connection is free. A luggage and a laundry services are also available in the hotel. 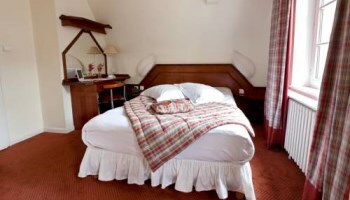 The Lagrange Apart'Hotel Strasbourg Wilson also enjoys a location in the centre, in the Gare de Strasbourg ("Strasbourg railway station") area, close to the borough of La Petite France, which is only 10 to 15 minutes away from the hotel. You can reach La Petite France by car, or by tramway, on line number 10, and get down at the stop Hôtel du Département, for instance. 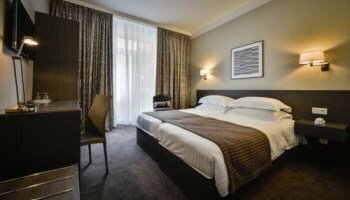 The Lagrange Wilson is 500 meters away from the Place des Halles mall, and only 350 meters away from Strasbourg railway station, which means that it will take you less than 5 minutes by foot. This location is ideal if you want to take a walk in the city and discover its most touristic places. What we like: The rooms' luminosity, provided by the wide windows. What we love: The nearness of the shops and the railway station. In French, "du côté de chez Anne" means "Anne's place". Such a name is an invitation to come and stay in this hotel, just like you would spend a weekend at a friend's. Indeed, "maison d'hôtes" is the French for "guest house"... which is why the owner rents out charming and lovely guest rooms. Charming and lovely, these are two words that describe Chez Anne perfectly! What's more, you'll feel at ease (and like home), since the number of rooms (hence, the number of clients) is limited. Indeed, there are only five rooms! Those rooms are all titled after a flower: the guest room Pâquerette ("Daisy"), the guest room Pivoine ("Peony"), the room Bouton d'Or ("Buttercup"), Bleuet ("Cornflower") and Coquelicot ("Poppy"). The prices are ranked from 155 to 185€. Each room's decoration is unique. However, they all have one thing in common: an impressive bed head, either made out of red velvet or of fake coral and a bedspread made out of animal skin! Well, we don't mean animal skin, it is just imitation fur! In this hotel, they don't display their hunting trophies all over the place... The only thing they actually "display" is comfort! So, go and loll in the fine sheets and take baths in the state-of-the-art bathtub and shower. When you're done sleeping and resting in your bedroom, you can go and take a look around the country-like tea room that you will enjoy after you've booked it, and with 24 other guests, for the number of customers is limited to 25. What we like: The room Bleuet, with its blue velvet furniture, its golden bed head and its off-white bed linen; it all makes a peaceful and comforting cocoon. What we love: To be in a quiet place, but still have the opportunity to travel easily, thanks to the bus and the tramway lines: the bus stop Carpe Haute, on bus line number 15 and 15A, is only 300 meters away. 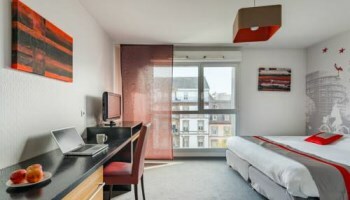 The Ibis Strasbourg Centre Ponts Couverts is in the middle of town, which is an important advantage if you want to spend your holiday in a lively neighbourhood well connected to several touristic (and less touristic) sites. The hotel is located along the Ill River banks: the Ill circles the area of La Grande Île; it is surrounded by the boroughs of the railway station ("La Gare"), of Krutenau, and Poincaré in the northern part. The establishment comprises 244 rooms, 5 of them are accessible for the disabled, for customers with reduced mobility. 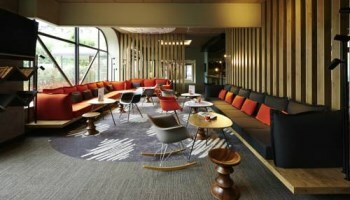 This 3-star hotel also has a bar and a restaurant: thus, you can do everything you want on site. You'll be served Flammkuchen and dishes adapted for both families on holidays and workers on a business trip in its non-smoking restaurant. Speaking of business men, there are 4 meeting rooms available for you to host your seminars. The foodies will be happy to know that, apart from the restaurant and the bar, they will have the opportunity to taste some barbecue grilled meats. As for touristic activities, you might want to know that you'll be only 800 meters away from Strasbourg's SNCF railway station. The N1 bus stop Musée d'Art Moderne is just at the foot of the hotel. It will take you only 20 minutes by foot to reach Rohan Palace ("Palais Rohan") in the centre of town. Ditto for Strasbourg cathedral, which is a little further away from the Ill River banks. What we like: The MAMCS, Strasbourg's Museum of Modern and Contemporary Art, is only 300 meters away from the hotel. 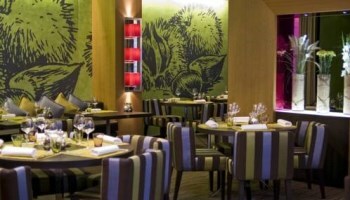 What we love: The bar's innovative decoration: the walls are covered in black and white drawings. The Cerise Strasbourg is one of the numerous apart' hotels that have been blooming up all over the country lately. You will book either a studio apartment, either an apartment for your holidays. The hotel comprises 137 apartments and studio apartments, scattered over five floors. They are all equipped with a television, a kitchenette and a micro-wave oven. What's more, there are no additional fees for the Wi-Fi connection. 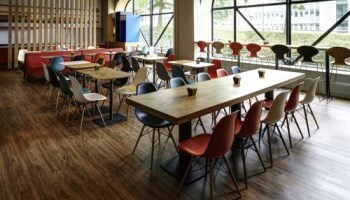 As for the furniture, it is simple and functional: there are orange chairs and two brown tables, one is a desk, the other is the dinner/lunch table. 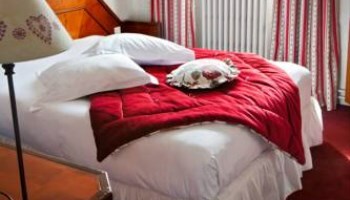 Most of the bedding is either brown or cherry-red (in French, "cerise", means "cherry"). Rooms are wide, clean and cosy. You will spend a nice stay in a modern and sober setting. The hotel is close to Strasbourg's central boroughs. Means of transportation are also quite close. You can reach the hotel from line A tramway stop Couffignal. With the same tramway, you'll be in the heart of the city in only 10 minutes. Couffignal tramway stop is also 15 minutes away from Strasbourg SNCF railway station. 15 minutes is also what it will take you to reach the railway station Strasbourg-Neudorf... by foot! What we like: The Box Repas Complet ("Full Meal box") packed lunches. What we love: The nearness of the City of Music and Dance, only 15 minutes away with tramway line A. As its name indicates, the topic of this hotel is the rose. Roses, I mean. Plural. The hotel used to be called Hôtel aux Trois Roses, which means "the three roses hotel". Then, they changed the name, maybe in order to prove that the services and the opportunities are increased in this 2-star establishment. Roses bloom up in great numbers in Alsatian gardens. 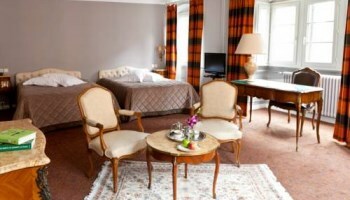 They are also growing in the sophisticated and lovely Hôtel Roses' 34 rooms. They are mostly displayed over bed heads, or sketched on large canvases hanging on the walls. The ornamentation and the design of the rooms revolve around several topics: for instance, some rooms were conceived artistically, like the Héros de la Littérature ("Literature Heroes") rooms. Both their organization and their furniture will remind you of writer Marcel Proust's novels, Alexandre Dumas fils' Camille, or The Count of Monte Cristo, written by Alexandre Dumas père. But if you don't recognize what inspired the owners, don't worry! You'll find some clues, for the titles of all these novels are written on the canvas above the bed. Furthermore, there are other topics of decoration: the adventurers, the romantics, "Rêve et évasion" ("Dream and escape"), and Arts and entertainment. This establishment, with its carefully-chosen ornamentation, benefits from a central location, near the heart of the city, close to Strasbourg's famous cathedral. It will take you a 10-minute walk to get there. 500 meters away from the hotel, you will find the Palais Rohan, built in 1704 at the request of Strasbourg's prince-bishop, Armand de Rohan-Soubise. The Palais Rohan hosts several museums: the Museum of Fine Arts, the Museum of Decorative Arts and the Archaeological Museum. And let's not forget the ceramics and the Italian and Dutch paintings! The Hôtel Roses is located along the Ill, which will allow you to enjoy a relaxing and quiet environment. What we like: The rooms' soft and soothing colours. 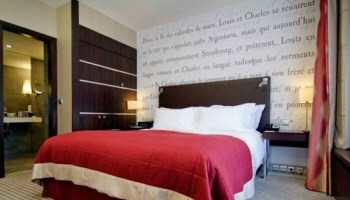 What we love: The candies spread all over the beds in the "Rêve et évasion" rooms. And we thought there was going to be some rose petals! 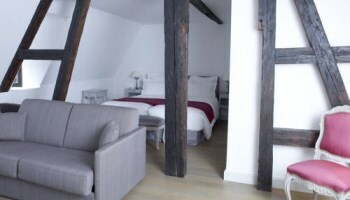 The atmosphere is cosy, simple and homely; just like typical Alsatian houses, this hotel is composed of studs and beams, all gathered in an Alsatian "Stub" on the ground floor. The building that nests this beautiful hotel, located in a touristic area, was first built during the 17th century. Notre Dame cathedral is only 300 meters away, and the Temple Neuf Church is reachable in a 5-minute walk. What could be better than a traditional Alsatian house near historic monuments, like this one? What's more, you'll just have to cross the street to admire Palais Rohan's impressive art collection. The European Parliament, situated in the Contades neighbourhood, is accessible in 15 minutes by car or by tramway: get down at the stop Parlement Européen, on line E.
Every room, from the cheapest (69€) up to the most expensive (139€), is equipped with a fan, so that you never suffer from heat. They also comprise a television with international channels and a free Wi-Fi connection. Moreover, this 2-star hotel will offer you an exceptional feature, especially for a cheap establishment: a pastry school! Before he arrived at the Hotel Suisse, Christophe Felder used to be the Crillon's head pastry chef, in Paris, and its career was only beginning! Few years ago, he started giving classes in the Jardin d'Acclimatation, in the western side of Paris; then, he went to Strasbourg and decided to do the same there. You can attend his classes after you've booked them. What we like: The rooms' wall ornamentation: white leaves and hearts grace the rooms' red or white walls; furthermore, they are equipped with ancient refined furniture. What we love: Christophe Felder's pastry classes.